If you’re just getting into the home security game, purchasing a security camera is an easy, less expensive way to make your home feel more secure without the commitment of a home security system. Fortunately, keeping your home safe doesn’t have to mean spending tons of money. We’ve put together a list of the best surveillance cameras around $150 or less to protect your family and home. Night vision Up to 15 ft. Up to 25 ft. Up to 30 ft. Up to 131 ft. Up to 20 ft.
Up to 15 ft. Up to 25 ft. Up to 30 ft. Up to 131 ft. Up to 20 ft.
*Standard retail prices as of 2/18/2019. Prices and availability are subject to change and may vary by retailer. You may have noticed that we’re talking about inexpensive cameras, but most of them cost between $100 and $150. That’s because cheaper security cameras—like those in the $30 to $50 range—are less secure and easier to hack. Wyze, for example, makes an HD camera for under $30. But customers complain that after they’ve shut it off, the camera records videos and uploads them to the cloud. We think it’s worth investing in a surveillance system that’s, well, secure. The Logitech Circle 2 is a cool little camera with a lot of useful details, including a built-in speaker and microphone for two-way communication and an expansive field of view. Logitech also offers 24 hours of free cloud storage so you can watch your footage as time-lapse videos in the Logi Circle app. The Circle 2 can do more techy stuff, but you’ll have to pay a $9.99/month subscription fee to access person detection, motion zones, and advanced event and alert filters. Also, some users note that while installation is easy, changing settings within the app requires them to completely reset the camera. The Logitech Circle 2 is a solid standalone camera with distinct advantages. It provides clear video, day and night, and is one of the only security cameras out there with continuous recording when activated by motion. Dimensions: 4.5 x 6 in. Night vision: Up to 25 ft. The Arlo Q is equipped with great image and audio quality, a long night vision range, and easily customizable settings. It also offers a generous Basic Cloud Service Plan with one gigabyte of storage, or seven days of cloud recording. Plus, you can easily download video from the app and save it on another device. 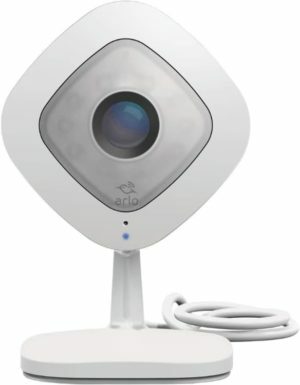 The Arlo Q offers continuous recording starting at $9.99 a month. You can choose what length of clips you want it to record—just know that the Arlo Q sometimes has to reboot itself after a recording, leaving gaps between recordings. The Arlo Q is a great value. If having more access to video footage is important to you, it’s a fantastic and inexpensive option. Dimensions: 2.4 x 4.1 in. 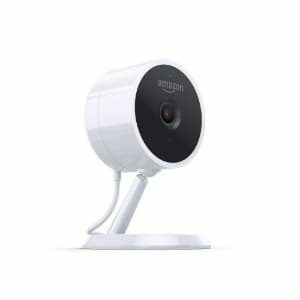 Night vision: Up to 30 ft.
Amazon’s Cloud Cam gives you access to a live HD video feed, night vision capabilities at 30 feet, and 24-hour clip storage. And because it’s an Amazon device, it plays nicely with your Alexa-enabled devices. The Amazon Cloud Cam lets you download and share video clips, which is a definite plus. But to really use it as a security camera—with person and audio detection—you’ll have to subscribe to Amazon Drive. Without it, you’ll get notifications only when general motion is detected. The Cloud Cam also doesn’t offer continuous recording, whether you have Amazon Driver or not. 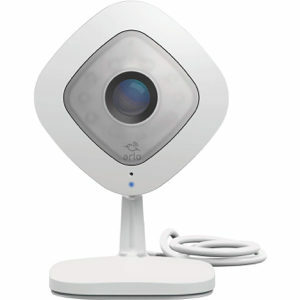 >>Learn more: Read our Amazon Cloud Cam review. If you’ve started building your smart home with Alexa, the Amazon Cloud Cam is a great fit. 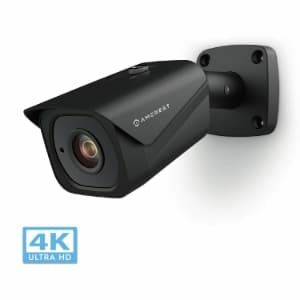 Night vision: Up to 131 ft.
Amcrest’s UltraHD Outdoor Wi-Fi Bullet camera is made for the outdoors with its weatherproofing and outstanding night vision. Its 8MP resolution lets you livestream footage in ultrahigh definition. You can even record events as they happen and store them in the cloud. This bullet camera has a higher streaming quality than Amcrest’s older products, with night vision up to 131 feet. Its power over Ethernet (POE) installation may require some technical know-how, but it’s worth it: POE means network interruptions are less likely. With its POE setup, the Amcrest UltraHD POE Bullet is great for rural areas where Wi-Fi can be spotty, but it would work in more suburban areas too. Dimensions: 2.8 x 2.8 in. The Blink has a simple, easy-to-use design meant to keep your home safe, whether you use it indoors or out. The batteries last for up to two years, and Blink also offers free cloud storage. 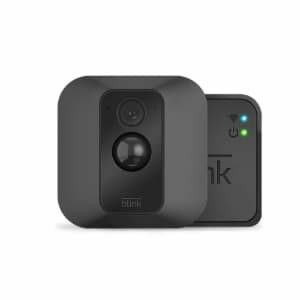 Blink offers solid basics: motion detection, HD video alerts, and live video streaming. But the HD quality leaves much to be desired. Although Blink lists its HD video capability as up to 1080p, some customers note that the quality is closer to 720p. That’s the lowest we’d recommend for a security camera. If you’re looking for a basic, no-fuss outdoor security camera that’s low maintenance and easy to set up, the Blink XT is a great fit. To find the best cheap security cameras, we considered price and quality, along with more technical features—like whether the units are waterproof and what image resolution they offer. We consider a few features to be nonnegotiable. If the security camera you choose has some or all of these features, you can be sure you’re getting enough security, even at a lower price point. With a high-definition image quality—720p or higher—you can see more of what’s happening with a clear picture. Higher HD video quality also gives you the chance to zoom in on important details like faces or license plates. Field of view refers to the area that a camera can see. The bigger the number, the wider the image frame will be and the more area the camera will cover. Night vision allows your camera to produce a clear image when its dark. That way, your camera captures clear images, no matter what time of day. Two-way audio is a nice bonus. Security cameras with two-way audio have both a built-in speaker and a microphone, and they allow you to listen and speak—to your family or the FedEx delivery person, for example—in real time. IP (Internet Protocol) cameras transmit data through an internet source, like Wi-Fi or Ethernet. You can access that data as digital video from your mobile device or web browser. Because they deal in the digital space, all the surveillance cameras we recommend here are IP cameras. D-Link’s cameras have some impressive features but poor reviews for the mobile app. The app is where you control everything you want your security camera to do, so a majorly glitchy app is a real issue. Although Q-See’s Wi-Fi bullet camera itself is solid, users note a complicated setup process. There are also too many complaints to ignore around unreliable customer support. At just under $30, Wyze’s indoor HD camera is a tempting pick. But as we’ve mentioned, cheaper security cameras are often less secure. And Wyze customers complain about cameras recording after being shut off and having no control over data while it’s in the cloud. 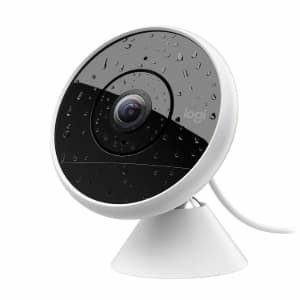 For most people, the Logitech Circle 2 is the best choice in inexpensive security cameras. It works both inside and outside, has two-way audio, and includes cool extras like 24 hours of free cloud storage that you can watch as a short time lapse video. It’s a great choice whether you’re new to home security or a seasoned pro. Ready to secure your home from the inside out?